MATR BOOMIE is a fair trade collection from India that marries modern design sensibility with inspiring traditional art forms, bringing people and cultures closer together. With the mission of creating opportunities for women and minorities to realize their creative, economic and leadership potential. They have grown to empower 20,000 artisans in 40 partner communities throughout India. 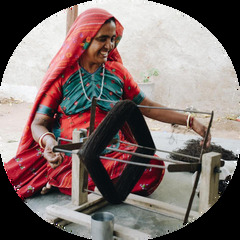 Their passion has enabled them to build a credible force in the fair trade market while making critical differences in the lives of partner artisans, their families and communities. And their experience brings you the best of both worlds: the trust, reliability and professionalism of an established wholesale company, plus exclusive, modern, boho-chic styles that appeal to ethical consumers.